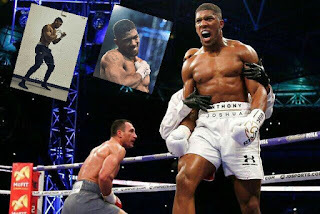 Nigerian-born British boxer, Anthony Joshua, is reveling in his massive win over Wladimir Klitschko in Saturday's world unification title fight at the Wembly Stadium, Completesportsnigeria.com reports. The London 2012 Olympic champion defeated the Ukrainian in the 11th round of their much publicised fight in front of 90,000 fans and on Monday wrote a message on his Twitter handle in celebration of his win. "Sieze the moment. #IWILL #UnderArmoukUK Heavyweight champion of the world," Joshua tweeted.